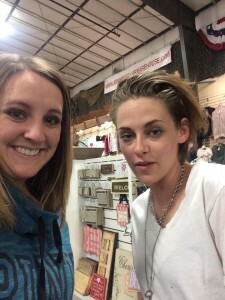 Army Surplus Warehouse - We had Kristen Stewart in the store today! She was awesome! She said she was just driving through. [Q: I saw somewhere that she is headed to Montana to do a motion picture.] That's what she told me too. "I was picking up clothes and she walked over to me and said sorry she did that and she would clean them up. I said no it's ok, hey are you Kristen? She said yes, was super friendly. She talked about how this area and idaho was beautiful. I asked if I could take my picture with her cause no one would believe me and she laughed and said of course. I did see a small smile too! Haha."